This was my final stop on what turned out to be a very productive Christmas trip. Thanks to unseasonably warm weather up north (well, warm in the afternoons and freezing in the mornings and nights), I was able to get in some great golf every day. On Sunday, I wanted to get home as early as possible, so I picked what would be a convenient course along the drive home. 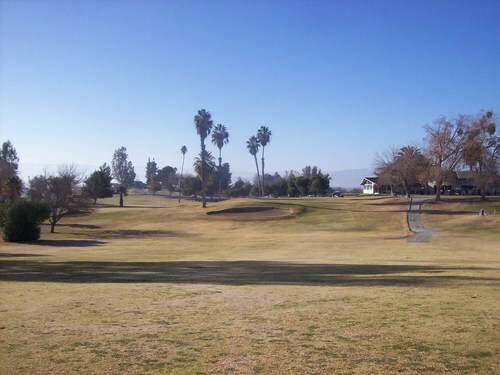 Buena Vista Golf Course is in Taft and is located just off the I-5 freeway. I had called ahead earlier in the week to make sure there wasn’t anything going on Sunday morning at the course and they let me know it was open for regular play. 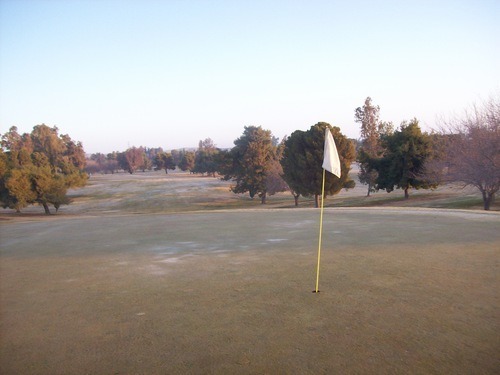 When I inquired about the potential for a frost delay, they told me they don’t have them here. To me, that was both good news and bad news. The good news is I could get out early and quickly as I wanted to. 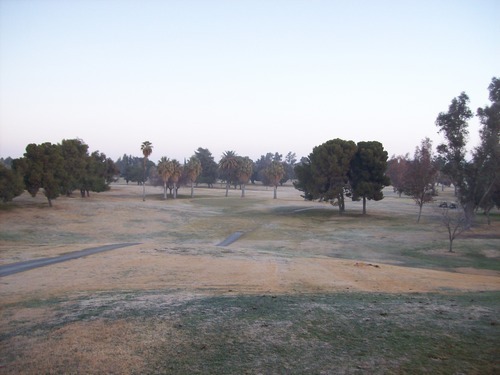 The bad news is that likely meant the course would not be in that great a shape if they don’t care about frost damage. 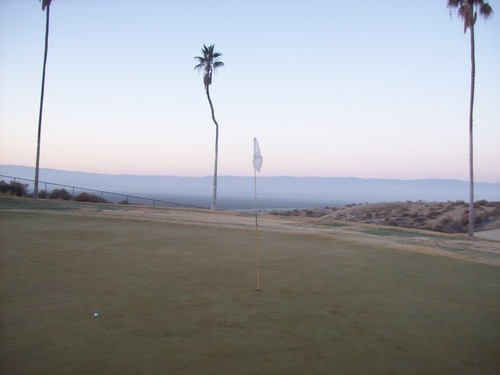 Oh well, I’m always up for an adventure, so I made my way out to the course nice and early. The place was already bustling with activity and what little light there was revealed a course that looked to be in terrible shape. It looked entirely brown without a speck of green to be seen. In fact, I almost turned around and hit the road. I thought I might save Buena Vista for another visit when it was looking a little nicer. 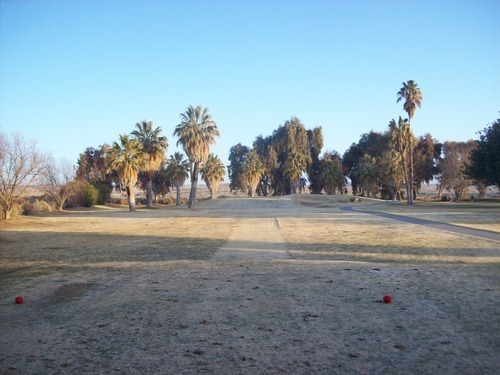 As a Kern County course, it was on my SoCal regulation “to do” list and my expectations were low to begin with, so I knew I had to play it eventually. Since I was there, I went ahead with the plan. I checked in and they said I could head out to the first tee right away by myself. The price was a reasonable $38.50, which included a cart. I teed off a little before 7:00. I played through a couple of twosomes along the way and finished the back nine behind the lead twosome, who were moving at a pretty decent pace. I finished in about 2.5 hours, which worked out well as I was able to get home to Irvine by noon. The conditions turned out to be more aesthetically “ugly” than anything else. 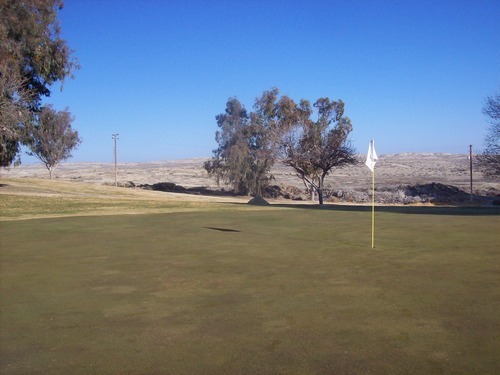 In fact, the course was in pretty decent playable condition. It looked terrible, but it played fine with all the grass being dormant. 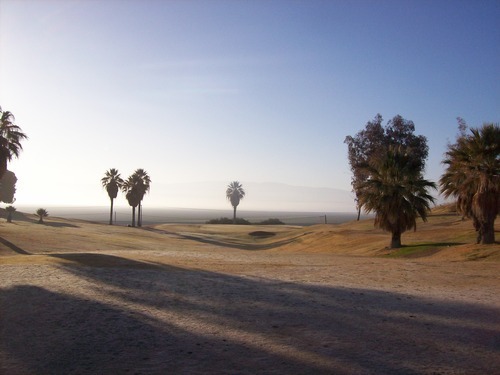 There was no distinction between the fairways and the rough. It was all just one basic cut that sprawled throughout the course and I generally had good, consistent lies. There were plenty of thin spots, too, but not as bad as it looked. The greens were fine. They were a little beat-up looking with footprints and ball marks, but not too bad. There aren’t many bunkers on the course, but I managed to find two. They each had different types of sand, but both were pretty good to hit from. The course itself turned out to be more interesting than expected, as well. 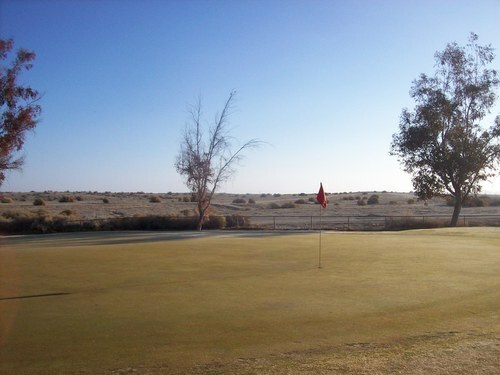 Given the flat, desolate landscape here, I figured the course would be very basic and boring. For the most part, it was a pretty traditional layout. Nothing overly exciting. However, there were some minor elevation changes mixed throughout the layout (including the first hole which features a severely elevated green and pretty much blind approach shot). 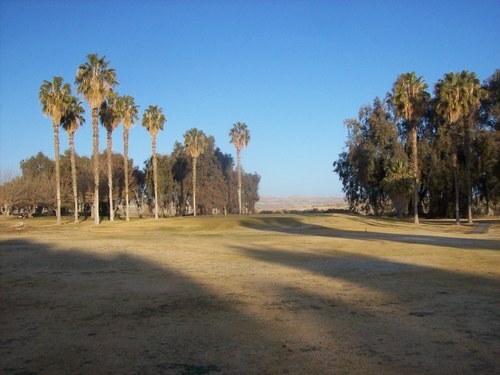 The holes are lined with trees (including plenty of palms), but they don’t come into play too much. 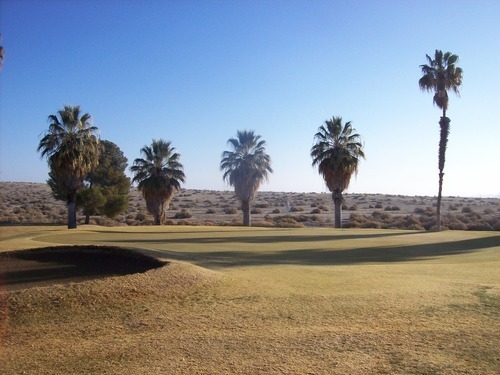 On the outer edges of the course, you get some decent desert background scenes to provide a somewhat interesting backdrop. With the Buena Vista name (meaning “good view” in Spanish), you might hope for more dramatic scenery, but in this area, you take what you can get. I guess “good view” is a relative term in this particularly uninteresting stretch of the Central Valley. Though I doubt I’ll ever come back, Buena Vista turned out to be a more enjoyable experience than I expected. It’s a convenient option if you are driving along the I-5 and the prices are reasonable. Just don’t expect too much from it, though. 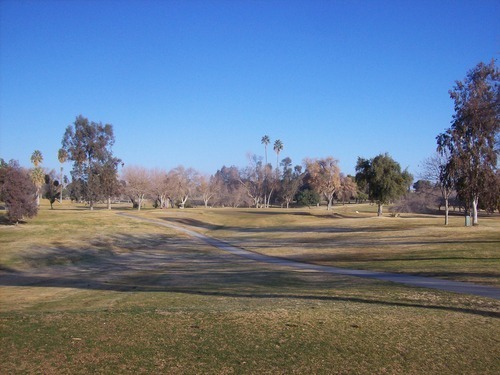 I do think this course would have a ton of potential with a major remodel and some rebranding (think Stevinson Ranch or Diablo Grande, though the base layout is nowhere near as good as either of those), but I don’t think the Taft area could or would support a more expensive golf course. 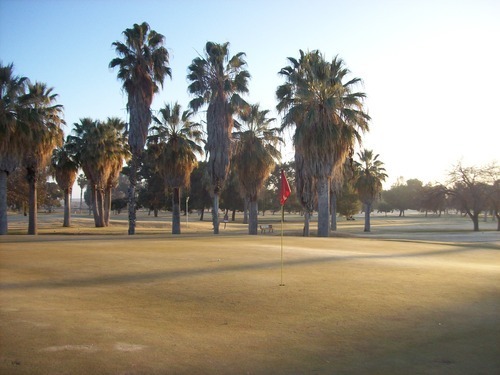 It’s primarily a locals’ course and it serves that purpose just fine.